Pictured here with the Columbia Chapter, National Society Daughters of the American Revolution, is the MOSSAR Color Guard Team on Sunday, June 4 2006. 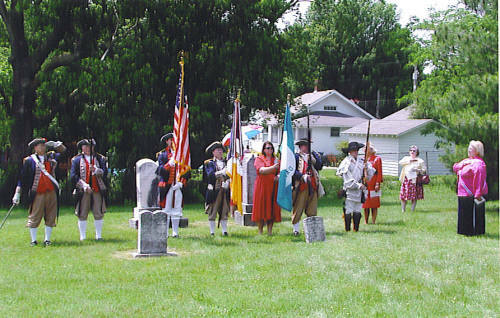 The team participated in the grave marking ceremony of Revolutionary War Soldier Samuel Elgin of Maryland. Patriot Samuel Elgin is buried in the Columbia City Cemetery in Columbia, MO. Photo (L-R): Major General Robert L. Grover, MOSSAR Color Guard Commander; Compatriot Alnin L. Paris, Compatriot Frank G. Rifle, Compatriot J. Bragg Stanley, Captain James L. Scott, Captain Russell F. DeVenney, Jr., and the Columbia Chapter, National Society Daughters of the American Revolution.